Watkins Glen State Park is in the running for USA Today’s Reader’s Choice 10 Best State Parks in the country! Learn more about the contest and be sure to vote (once a day every day until March 30th) by clicking here. Of course, the park has numerous accolades to its name including these most recent titles: Top 10 Places to Pop The Question in the Northeast by the Huffington Post, 30 Most Surreal and Beautiful Places in the US, and Top 27 Places That Foreigners Are Craziest About Visiting. But how about some information you might not know about the history of this beautiful park? 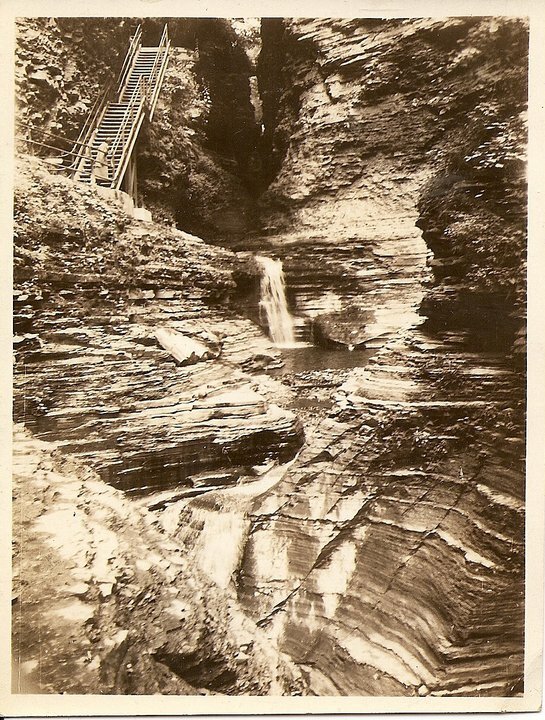 In 1794, John Watkins and Roy Flint of New York City purchased 325,000 acres of land at the southern end of Seneca Lake from the State of New York, including what is now Watkins Glen State Park. Watkins constructed various mills within Watkins Glen (then called Big Gully) including a sawmill and gristmill. John Watkins left the area in 1808 after a fire destroyed the mansion he had built above the gorge. The property was not further developed and following John Watkins’ death, his brother Dr. Samuel Watkins inherited it. Dr. Watkins arrived in the area and began 40 years of development, constructing roads, homes, shops, and a hotel. 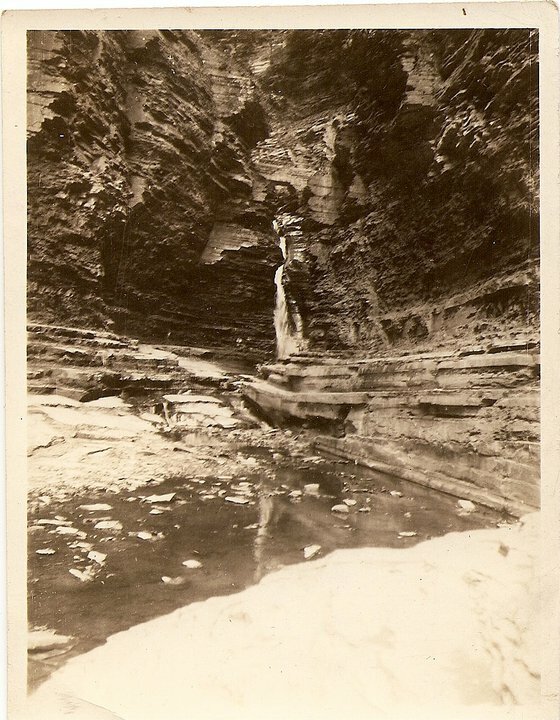 He also built flour, saw, and plaster mills within the Watkins Glen gorge. When Watkins died, his widow Cynthia inherited his estate. Thanks in part to her urging, in 1852 the village (previously known as Jefferson) was renamed Watkins in honor of Dr. Samuel Watkins. 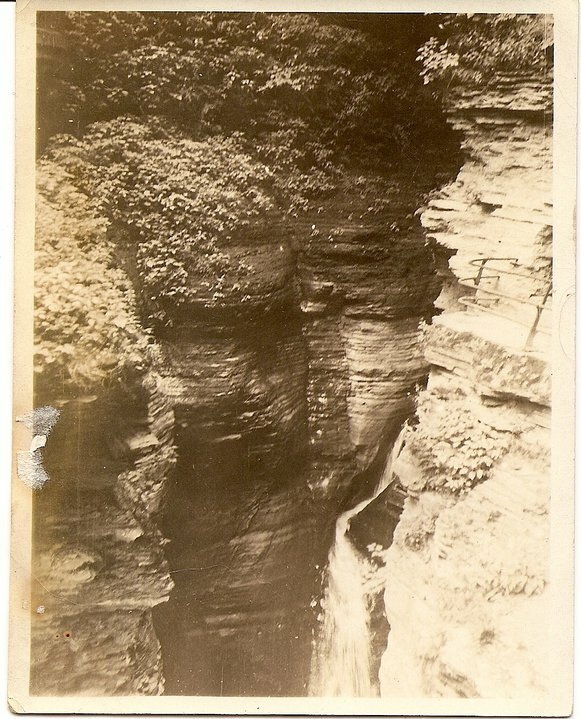 When Cynthia died, her husband George Freer inherited the estate including “Big Gully” (the Watkins Glen gorge). Did you keep up with all of that? I had to read and re-read to make sure I had it all straight. It is amazing to track the path that this property took through history. In 1856, a newspaper editor named Morvalden Ells moved from Elmira to the village of Watkins. He was drawn to the glen and explored it with great interest. He was also known to have a great knack for marketing. Ever of the enthusiastic, entrepreneuring mind, George Freer sought Ells out in hopes of opening the glen to tourism. The two formed a partnership and in 1858 various improvements to the glen began including building wooden stairs, clearing and expanding paths, and building a gated entrance. 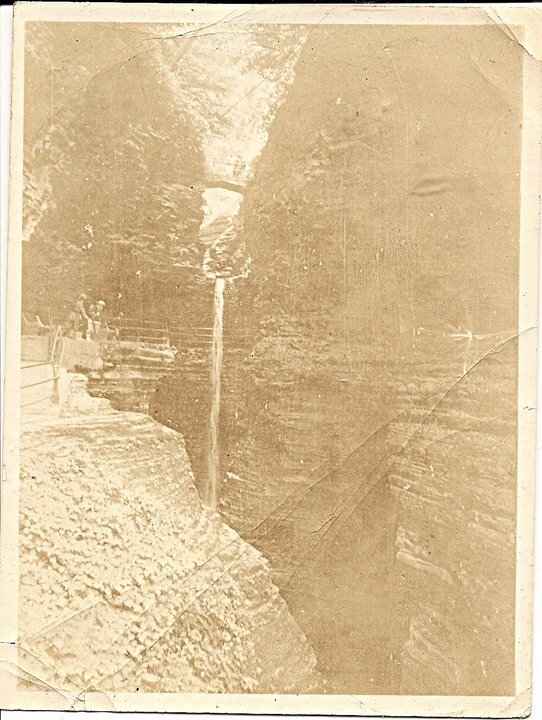 On July 4, 1863, the glen opened to the public (from the entrance to Cavern Cascades) with the name “Freer’s Glen: Mysterious Book of Nature”. Over 10,000 tickets sold in the first year. Over the next several seasons, other portions of the trail opened. In 1869, Freer sold the glen to an entrepreneur from Troy, NY for $25,000 named EB Parsons. He continued to develop the glen as a tourist attraction, with Ells assistance as a manager. It was during this time that the gorge begins being referred to as “Watkins Glen” – though not officially named. The state purchased the land in 1906 and then formally took over its development in 1911. Of major significance, The Great Flood of 1935 hit the Finger Lakes region on July 7, 1935. 12 inches of rain fell in about 3 hours. 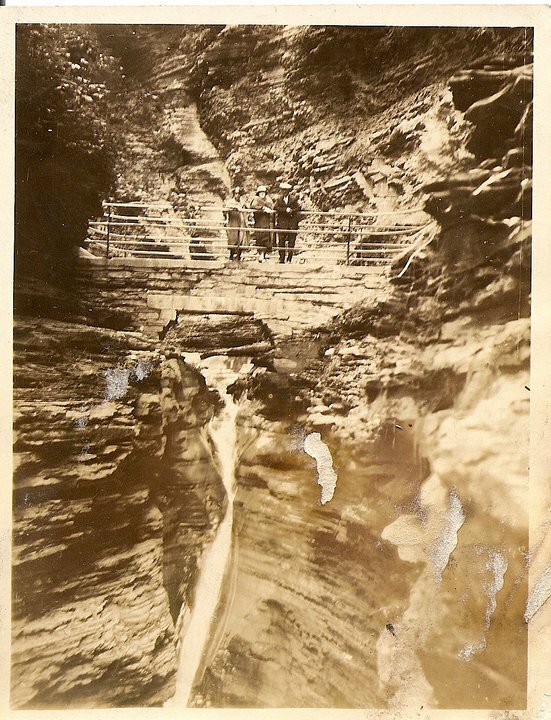 The Glen Creek gorge filled with water and debris, taking out the New York Centrail Railroad trestle and much of the infrastructure of the Gorge Trail. Historical documentation points to witnesses who claimed that the flood waters practically filled the gorge. Many homes and businesses in the village were destroyed during this catastrophic event. Following the flood the Civilian Conservation Corps (CCC) was tasked with rebuilding and making park improvements. Their hard work and craftsmanship is still visible today in the natural stone and mortar work throughout the park. Clearly, we’ve hopscotched through history. If you’re interested in learning more, I strongly recommend NYFalls.com, the source of much of the information in this post. NYFalls is an admirable organization, originally created to “promote the preservation and continued enjoyment of upstate NY watersheds, and the wonderful waterfalls and gorgeous present in the area.” Visit their website: www.nyfalls.com. 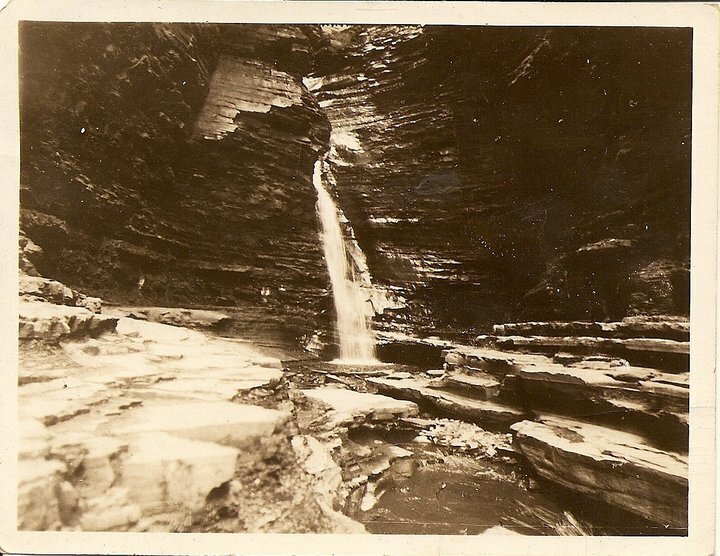 In the meantime, enjoy these great historic photos from the park and be sure to vote to make it the Best State Park in the country!